I remember when bike helmets first came in and how utterly horrified I was by the look of them. Gone were my days of carefree ‘wind in the hair’ bike rides. For an Eighties kid, it was a lot to get used to and, as an image-conscious teen, the way those helmets looked was of prime concern. So here’s another thing for us Gen X and Y parents to be slightly envious of. Our Generation Z (and this year’s brand new Alpha generation) kids are reaping the benefits of fashionable bike gear. The latest comes from Kiddimoto whose balance bikes featured in our Christmas Roundup for 2009 and again in February this year with its new Brit-flavoured designs. Now kidlets can have supremely groovy head gear with the release of the Helmuts range. They have been approved by Australian Standards so you can purchase in the knowledge that substance has not been sacrificed for style. 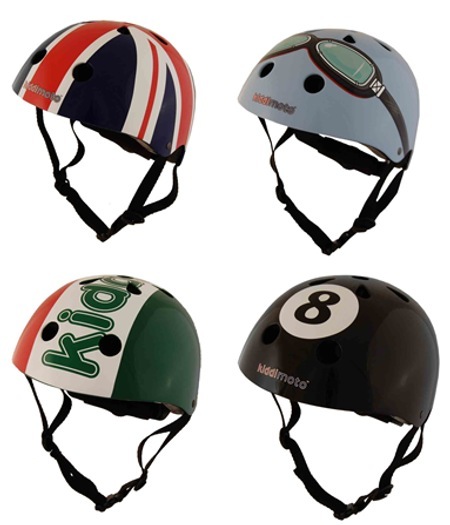 There are a range of cool designs including the Eight-Ball, Goggles, Union Jack, Italian Flag and white spots on red. Suitable for kids aged two to eight, buy from Kiddimoto from April 1 for $79.95 each.